NORTHAMPTON, Mass. – Smith College Professor Ileana Streinu today will receive a prestigious award for mathematical research addressing a longstanding fundamental problem in geometry, with applications in robotics and computational biology. Streinu, the Charles N. Clark Professor of Computer Science and Mathematics at Smith and a Five Colleges 40th Anniversary Professor, accepted the accolade at the Joint Mathematics Meetings in San Francisco. The David P. Robbins Prize from the American Mathematical Society (AMS) is awarded every three years for a paper that reports on novel research in algebra, combinatorics or discrete mathematics. Streinu was honored for her algorithmic solution of the “carpenter’s rule problem,” which asks whether any polygonal chain – a connected series of line segments – can be continuously straightened out in a way that avoids self-intersections. In Streinu’s explanation, the polygon edges are taken as rigid, but the vertices are joints that allow rotation, turning a mathematical object into a simplified model of a robotic arm. While the carpenter's rule is confined to two dimensions, robots – like humans – are three-dimensional. They may get entangled in space, but - as the carpenter's rule result shows - the two-dimensional ones cannot. The key comes down to expanding the distances between the joints, says Streinu, who spent years examining the problem who has intrigued mathematicians for more than three decades. In granting the award, the AMS called Streinu’s paper “beautiful and highly original.” Titled “Pseudo-triangulations, Rigidity and Motion Planning,” the paper was published in the journal Discrete & Computational Geometry in 2005. Streinu’s research was supported by funding from the National Science Foundation and by the Defense Advanced Research Project Agency’s “Mathematical Challenges,” as well as Smith, the University of Massachusetts at Amherst and sabbatical visiting positions. 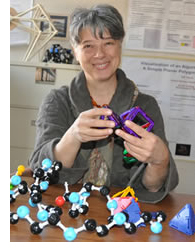 Streinu’s most recent work extends in multidisciplinary directions, ranging from robotics and origami to the emerging fields of bio- and nano-geometry, where she is pursuing mathematical questions arising in studies of flexibility, rigidity and motions for macromolecules. After receiving her doctorate in computer science from Rutgers University and doctorate in mathematics from the University of Bucharest, Romania, both in 1994, Streinu began teaching at Smith. She has also held visiting positions at the Technical University in Berlin, Ecole Normale Superieure in Paris, Stanford University, Kyoto University and the Universitat Politecnica de Catalunya in Barcelona. Founded in 1888 to further mathematical research and scholarship, today the American Mathematical Society has more than 32,000 members.